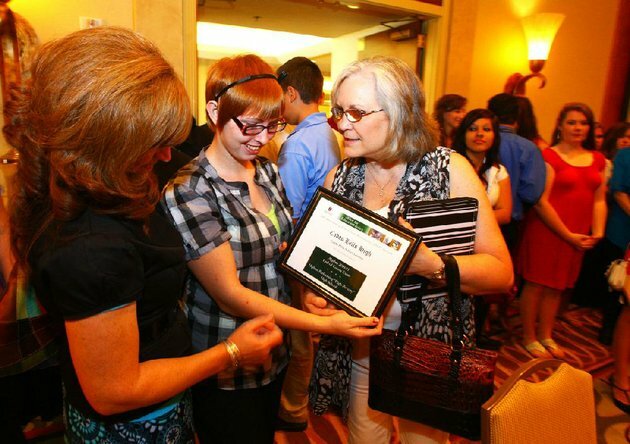 A student and teachers from Caddo Hills High look at their OEP Award handed out at the annual Office for Education Policy Conference in Little Rock (photo courtesy of the Arkansas Democrat Gazette). We write you today with exciting news! We will be holding our annual OEP Conference on Wednesday May, 15th at the Peabody Hotel in Little Rock, AR from 8:00 AM until noon. Thus, please consider this post as your “Save the Date” notification. As the details of the conference begin to take shape, we will send out more information, including the detailed agenda, a registration link, and literature on local hotels and eateries. We are also trying to assess interest in providing professional development credit for attending the conference. If you’re interested in receiving PD credit, please email us at oep@uark.edu. However, for now, we hope you will mark your calendars for Wednesday May 15th from 8:00 til noon so we can see you all at the OEP Conference. Take care.